Purpose: Paper chromatography is the process of purifying different chemicals by placing the whole chemical on a piece of paper and placing the paper in water so as to cause the water to climb up the paper. As it does this, the different chemicals will separate out due to factors such as how well each dissolves in water. Common experiments utilizing this technique include marking a dot with a black felt tip pen and running alcohol through the piece of paper. However, this experiment will focus not on the chemical to be dissolved, but rather, the speed at which the water climbs up the piece of paper. Hypothesis: The hypothesis of this experiment is that the rate of chromatography is dependent on factors such as type of paper used and type of solvent used. Equipment: Needed for this experiment is scissors, paper, glass, water, alcohol, a pencil, a ruler, and a stopwatch. Procedure: The first step is to cut out several strips of paper and mark two lines on each. One line will be 1 cm from the bottom of the strip, and the other will be 2 cm from bottom, 3 cm, 4 cm, and 5 cm on different strips. Pour relatively 1 cm of water into a cup and place strip into water so that the 1 cm line hits the top of the water. Start the stop watch and time until it reaches the next line. Record results and compare for different papers and different solvents. 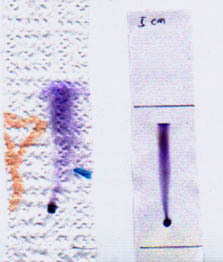 Pictured is chromatography done with alcohol on a paper towel (left) and printer paper (right). The substance being separated is blue ball point pen ink. Total time on paper towel 3 mins 46 seconds. Time spent on chromatography with printer paper 1 hour 5 minutes 51 seconds. Conclusion: It appears from the results that changing the solvent or the type of paper used in the experiment is of vital importance to the results of a chromatography experiment. Utilizing paper towels in the experiment provided very quick results, however, not as clean results as with the printer paper. The hypothesis in this experiment is therefore correct and by utilizing this vital information Scientific AmeriKen can proceed onward to the excitement of further discovery using paper chromatography!